Looking for a family tent that fits the family; not too heavy and also a fast set up? There are plenty of tents in the market place, all of which talk about the ease of set up and take down but in reality, some of them are not that fast or they weren't suited to what we needed. Serious research of available tents that suited our upcoming camping needs, resulted in the decision that we needed a canvas touring tent. Our other family tents, whilst meeting some of our camping needs, had a couple of issues that stopped us taking them out as often as we wanted. The main two reasons: weight (and therefore bulky) and not always suited to a one night stop over. Touring tents are meant to be for those who are moving about frequently and don't want the hassle of setting up with lots of parts every night. But still suitable for that camping weekend in one spot. 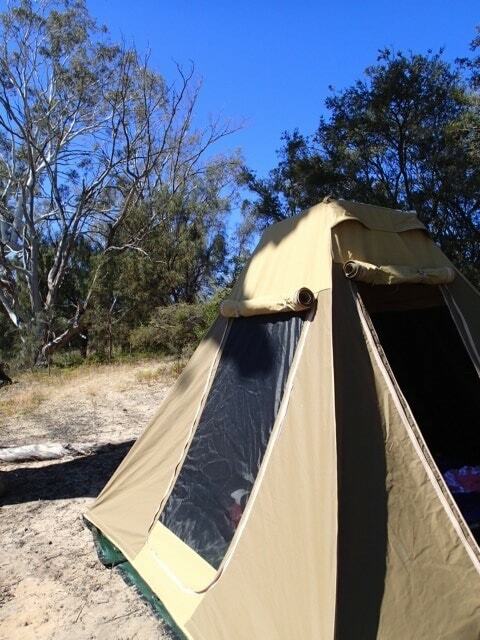 The main contenders in this camping niche of canvas tents were Oztent, Freedom Camping and Southern Cross. All 3 of these manufacturers come with excellent reputations and forums full of people singing their praise. Of these three, the only tent we could see in person before purchase was the Oztent which seems to have the widest distribution and most readily found in camping stores. But early on, we discounted the Oztent - not just for the price, but the ability to transport it when packed up on our roof racks. This needs to be a serious consideration for anyone buying one - the ability to fit on your vehicle. We also had read that many people needed to buy an awning to stop the moisture from getting inside the tent, and as we were trying to reduce time of set-up, an awning wasn't something we wanted to be fiddling with. The RV5 weight of 25kg was also a concern to me, as my lack of muscles would mean that I would struggle to carry this tent and would always have to rely on husband to move it. Freedom Camping and Southern Cross were the next tents of choice to look at. We couldn't find a place in Adelaide that had either of them on display, so we had to rely solely on websites and forums and reviews by others to narrow down our choice. There was not much to separate the ones we were looking at and every site had positives about both. It was hard to find a negative on either. We had to choose between the Freedom Camping Northern Tourer or the Southern Cross Ultimate 10. The latter was chosen. 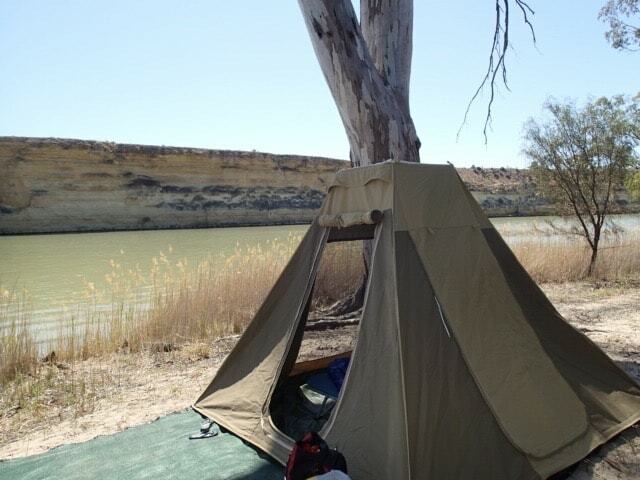 Being an Australian designed and made tent is a big positive to our choice as well - so much of our gear comes from overseas, it's nice to be able to buy Australian. Comes with 3 large windows and 1 door. The large windows allow extensive ventilation. The screens are super fine UV Stabilised flyscreens which are sandfly/midgee proof. The canvas is rot & mildew resistant, also has a UV rating of 50+ protection. Utilises a 3 piece double locking centre pole which is better suited with the use of awnings. Stainless steel ‘O’ rings which will not rust. This was the big test. The second biggest test is putting it away. The Southern Cross packs flat, in a large bag (provided) which meant that it can lie flat in our roof basket, or in the boot of the car. 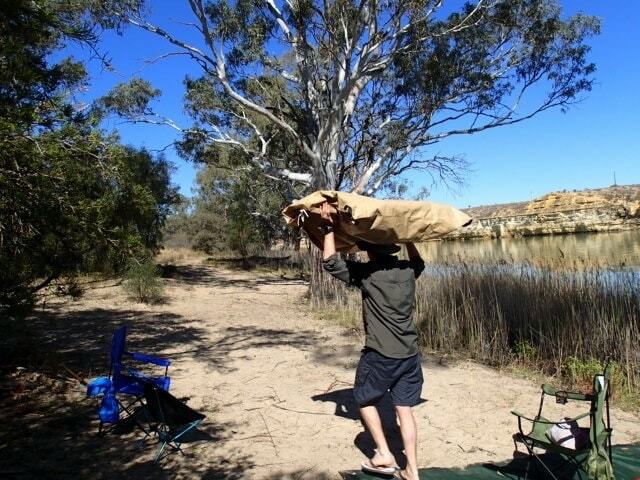 Just slide the tent out of the bag along with a 2 piece double locking centre pole (in its own bag). Then after positioning the tent (on a ground sheet - not provided - but there are a wide range of groundsheets you can purchase from anywhere; we use a mesh that keeps grass looking good), it was just a matter of opening up the tent fully, and working out where we wanted to position the 1 door. Peg out the four corners of the still flat tent with strong sturdy tent pegs (not provided), utilizing the O rings which are very securely attached to the canvas tent. With the centre pole, still not fully open, climb into the tent and position the pole underneath the eyelet on the roof of the tent, and push the pole upwards. The tent then lifts up around you. Straighten this 1 pole, and raise to the maximum height. Your tent is now up! On our first go, like any tent, there was a bit of thinking and plotting and planning about how we should do it, and if the tent was pegged out far enough, and if the pole was up high enough. All things that become easier with use and practice. Time wise, it took about 5 minutes - which isn't really long. I know other tents talk about 30 second set up, but that is before the fly is added. This tent has no fly and does not need one. And the 5 minutes also includes laying out the groundsheet, and making little adjustments. If you want to put up awnings for weather protection, then that is separate to the time above as awnings do take a bit more adjustment and tying down, so if weather looked inclement, you would need to allow that time - the same as you would with any tent awning, regardless of the manufacturer. Taking the tent down is fast . Climb into the tent, and undo the centre locking pole. Lower the pole and step out of the tent. Remove the centre pole and the tent is down! The trickiest part is now....... Folding the tent back into a shape that fits the bag. It's a matter of getting the roof section of the tent in a certain part of the flattened tent, so you can fold it (like you would a sheet) so it fits into the bag. Have the bag close by as a guide to what size you need to fold it to fit. Once you do it, 1-2 times, it becomes easier and faster. It really is a very easy matter of taking down the tent, and easily put down by 1 person (as is the putting up). Now that the tent is all set up, what's it like inside? We could easily get 3 stretchers in it, with the centre pole in use. If we wanted to purchase the side pole kit (which means no centre pole), that would give a bit more room. Update 2016: Regardless of the centre pole, we still managed to get 4 stretchers in the tent on our most recent camping trip: and with room to spare! I love being able to stand up fully in a tent, and get changed and move around a little, without being all hunched over, which is a benefit to a tent this size. There are no storage pockets in our tent, which I think is an oversight by Southern Cross. It's great to have a few of these placed around the tent to hold keys, glasses, etc. A minor detail but I like that option in tents. The large windows that run literally from the bucket floor to the roof line, are fantastic - so much air and light can come in when you have the canvas covers rolled up, and at night, looking through the mesh, you wouldn't even know the mesh is there. The floor is vinyl and appears strong, though only time will tell on this, and it's a reason why we use groundsheets underneath all our tents. We weren't sure about outlaying more money for these, and thought maybe one of our existing tarps would do - and they probably could, but if we wanted something that fit closely to our tent, allowing no chance of rain coming in near the doorway, getting a custom made awning for this tent was the best option. This extra purchase will depend on your own camping circumstances, and is not a mandatory purchase. Southern Cross have a wide range of awnings, and we chose the large awning as it suits our needs. We chose the large because it offered us the most flexibility with configuration, and its design meant no pooling of water on the tent or awning should there be plenty of rain. A large awning meant that 4 of us in the family could sit easily underneath it, plus some of our belongings too. We ordered this separately via Southern Cross, and have to say that the service and response to our emails has always been fast and efficient, which is great customer service. It does mean that you now have something extra to find room for in the car, but like the tent, folds up flat. We don't put the awning up every time because if rain is not expected or if there is shade at the campsite, the awning can stay in the car. Update 2016: Tent and awning kept us perfectly dry in wet weather in Tasmania. Packed up tent, being carried! Canvas tents need to be seasoned. This means that whilst the canvas is strong and water resistant, during the construction of the tent, the sewing of the canvas left needle holes when the material was joined together. Those holes and seams, are where water will come through if the tent is not seasoned. When you look at the tent, where all those seams meet at different parts of the entire tent, you realise that there are a lot of tiny holes, that could let water in. We had to wet down the tent concentrating on key areas where water could penetrate, allow the tent to dry fully, and then do it all over again - about 3 times, so you need to have the tent set up somewhere where you and your hose (or heavy rain) can get this tent thoroughly wet. Initially, we didn't do this tent properly on the first go, and heavy rain let quite a bit of water in (lucky the tent was still in our backyard). So we have since wet down the tent, and allowed it to fully dry on more than 2 occasions. The ease of this tent set up and take down and accompanying weight was a key factor in purchasing this tent. In the world of the internet, where people are quick to give negative reviews of products, we just couldn't find any reasons why this tent wouldn't be a good purchase for us. It is very trendy to have an Oztent these days and they have a solid place in the touring tent market, but the SC Ultimate has the ability to meet a wider audience than those who have the big 4WD's to carry the Oztent. Is this the Southern Cross the fastest tent to set up? Possibly not. But of the canvas touring tents, it was one of the lightest, and folded up flat. So far, this tent is looking like our new family tent, and our Black Wolf Turbo Tent may not get many camping trips anymore! And based on reviews of others, this tent will see us through all of our camping days. 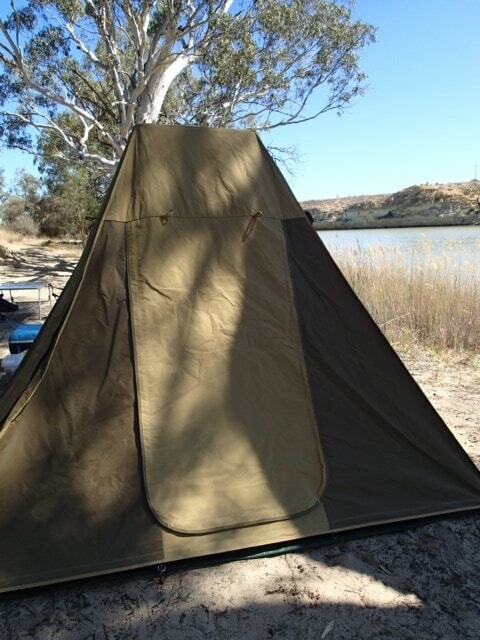 You can find more information and pricing on Southern Cross tents at their website. Depending on what size tent, the price is going to vary - and you will have to email them directly to get the price (not listed on the website). It's not the greatest website in terms of functionality or information which is a bit disconcerting when that's all you have to make a big financial decision on your camping needs, but their email response time is very good, so any questions, contact them directly. Need more tent advice? These stories will help you.